Thanks to Yuzuf for the heads up. 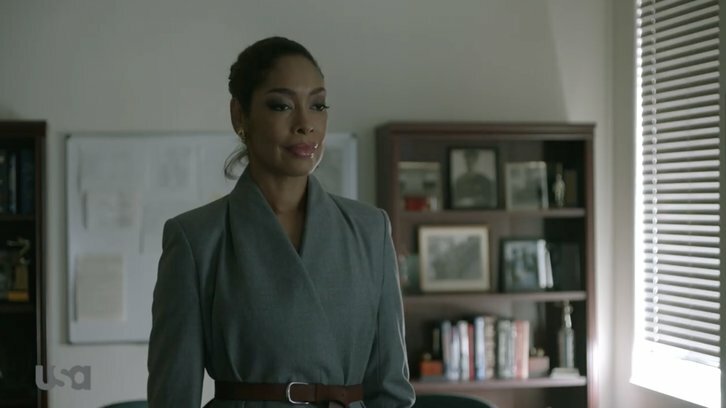 “Pearson” centers around the world of recently disbarred NYC powerhouse lawyer Jessica Pearson (Gina Torres) as she adjusts to down and dirty Chicago politics. Newly appointed as Chicago Mayor Bobby Novak’s (Morgan Spector) right hand fixer, Jessica is quickly embroiled in a crooked and dangerous new world where every action has far-reaching consequences. With her compulsion to win, Jessica is forced to reconcile her unstoppable drive with her desire to do the right thing – two things very much at odds. This new ensemble drama hails from UCP and is executive produced by “Suits” creator and executive producer Aaron Korsh alongside executive producer and showrunner Daniel Arkin. Doug Liman, David Bartis and Gene Klein of Hypnotic (“Suits,” “Nightflyers,” “Impulse”) also serve as executive producers. Additional cast includes: Bethany Joy Lenz (“One Tree Hill”), Simon Kassianides (“Agents of S.H.I.E.L.D.”), Eli Goree (“Riverdale”), Isabel Arraiza (“The Oath”) and Chantel Riley (“Wynonna Earp”).